Come Fall, Roy is back. It is official, you will see Colton Haynes on your television screen as a season regular this Fall on Arrow. While this is great news for fans of the show, there is bound to be some disappointment as well after Willa Holland (Thea Queen)’s decision to depart from the show came earlier this season. 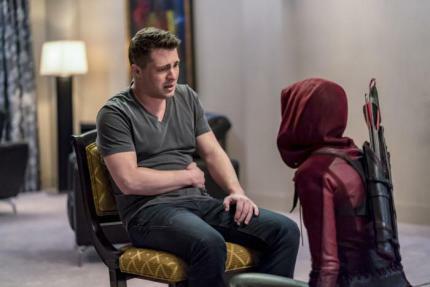 Roy Harper, aka Arsenal, has not been seen regularly on Arrow since his departure at the end of Season 3. There were a few guest star spots for him in seasons four and six, but he was nowhere to be seen in season five. Arrow executives released a joint statement regarding Colton’s return. It was not just the executives that were excited. 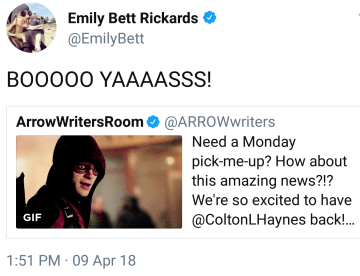 The Arrow writers, Stephen Amell, Emily Bett Rickards, and even Colton himself, took to Twitter to express their joy at the return of a beloved character. 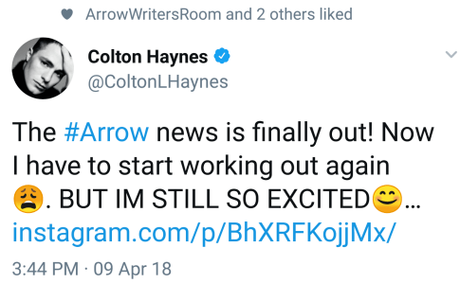 Colton returns to Arrow after taking some much-needed time off. Though his career was on the rise when he originally departed, he needed time to deal with some personal problems. He struggled with his mental and physical health. During that time, he went through a lot of changing times. Colton made an official announcement about his sexuality during his time away, as well as getting married. He had to deal with his mother’s sickness, which he shared with his fans on Twitter to try to help her, but recently lost the mom he loved so much. 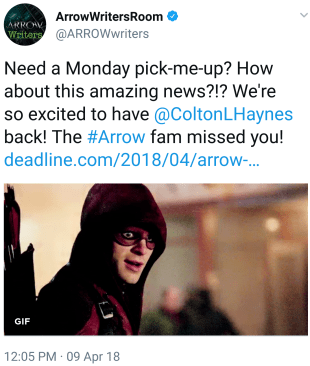 Hopefully, Colton’s return is therapeutic for him. Fans are definitely in his court, as many are just as excited about his return as his co-stars are. 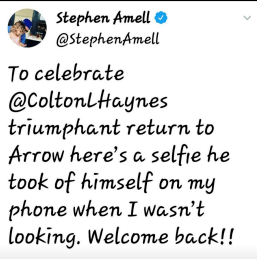 What is your reaction to Colton Haynes return? Tell us in the comments below.